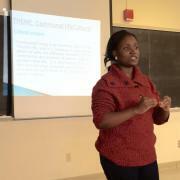 An understanding of Yoruba grants students access to a wide variety of Yoruba-speaking cultures across the globe. Yoruba is the native language of the Yoruba people, is an official language of Nigeria, and is widely spoken in Togo, Benin, and Sierra Leone. It is also a prominent language for communities in Brazil, Venezuela, Cuba, Trinidad, Tobago, Puerto Rico, and Haiti. Yoruba is a language of significant interest to linguists. 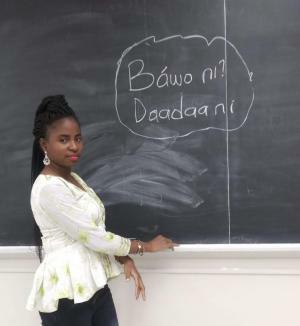 The skills demonstrated by mastery of less commonly taught languages such as Yoruba are valuable to employers and graduate programs, and fluency in Yoruba itself is sought by government agencies and international non-governmental organizations. 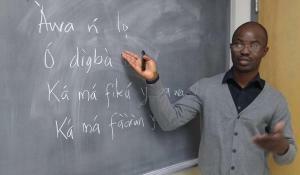 Yoruba classes at UW-Madison are small. Our students are eligible for highly competitive undergraduate Foreign Language and Area Studies (FLAS) Fellowships that cover partial tuition and provide a stipend. In addition to Yoruba language classes, we sometimes offer a course in Yoruba culture.